Will they be in the box? Google may be prepping a set of headphones where you can have access to Google Assistant voice tech without having to touch your phone. An APK breakdown - carried out by 9to5Google - revealed code strings that allude to the new headphones, which suggests you'll be able to both hear and reply to your notifications by tapping one of two hardware buttons on the headset. 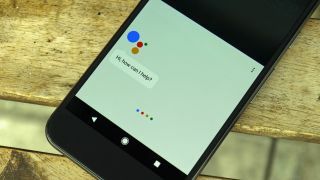 Another button can be pressed to activate Google Assistant but whether there will be volume toggles and a power button on the headset remains unclear. Google will apparently push over-the-air updates to the headphones, and we'd assume it'll run Android Wear as it's unclear what Google would be using otherwise. Whether these will be specifically for Google Pixel 2 phones remains to be seen, as we currently expect the new phone to launch without a headphone jack. It's also not known whether these headphones will be included in the box with the Pixel 2 or sold separately. A free pair of Bluetooth headphones bundled in with the phone may be a good way for Google to tackle the inevitable negativity from those who are upset about losing the headphone jack. Google may offer this as a Bluetooth alternative in a similar way to how Apple offered AirPods alongside the headphone jackless iPhone 7 and iPhone 7 Plus. We expect to see a launch for the Google Pixel 2 and Pixel 2 XL in October this year and it may be the case we'll see the company release this Assistant toting headset alongside the two phones.